Blondie and Brownie: Doughnut Plant Has Some Holiday Options! Doughnut Plant Has Some Holiday Options! A few weeks ago, I was talking about a craving for Shopsin's when a friend mentioned she had always wanted to go, but had never been. An after-Thanksgiving lunch date was planned, and it all went down on Sunday. Three of us sat at the counter eating a "Moe" and two Petes, shooting the breeze with Kenny and Zach as they closed up for the day, it was a quite perfect Sunday lunch. Afterward, I found myself walking down Essex, hoping that the frigid cold had kept the Doughnut Plant crowds away. I was wrong. Though there was a wind chill in the mid 20s, there was still a half hour OUTSIDE wait to get into Doughnut Plant. The only reason why I even toyed with the idea of staying on this line-I did make a valiant 7 minute effort-was for the Gingerbread doughnut. Brownie talks about it every year, and I secretly wondered why she's become so infatuated with it. 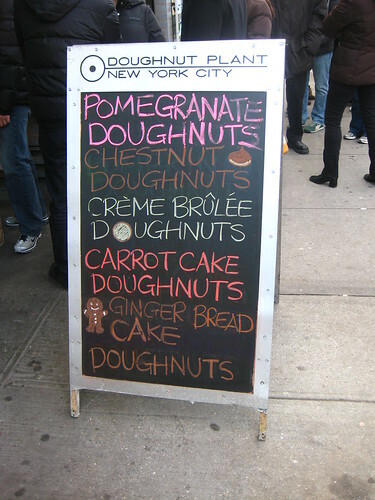 The sign outside promised that inside delicious holiday treats were awaiting me-Chestnut was also available. Unfortunately, a freezing sensation in my digits put the kibosh on such ideas. Maybe one of our Midtown Doughnut Plant outposts will come through! randomly came acorss your blog and love it!!! 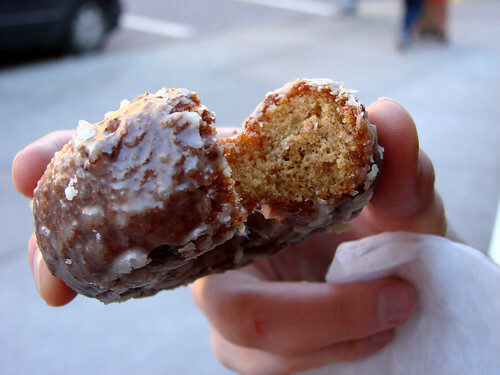 I went to the Doughnut Plant back in the summer of 2006 and got a Tres Leches doughnut....best doughnut ever. We seriously need a place like this is southern California. I'm drooling! Brooklyn Mac Brings the Cheesy Goodness! Potato Chips in a Cookie?! 'Tis the Season to Hit the Holiday Markets! Winter Comes to Shake Shack! Get Your Sufganiyot Before Hanukkah is Over! Hot Suppa Now Serving Supper! Three More Weeks of New Amsterdam!